Get the Popular Book Try! 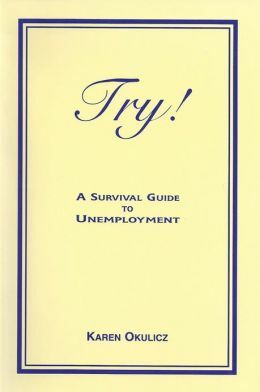 - A Survival Guide to Unemployment. TRY! "A Survival Guide to Unemployment"
Webster's definition of colander: A perforated pan for draining liquids. My definition of a colander: An object with holes in it to drain out what is not necessary and to save what is. At any time, people around you will blurt out unsolicited advice--what you should be doing, how you should be doing it, when you should be doing it, where you should be doing it, and why you should be doing it. This barrage of advice can seem endless. It takes a lot of patience not to scream "I'm working on looking for work. Leave me alone. Mind your own business". I do not need to tell you who you want to direct those statements to. You already know. However, most times these people are trying to be helpful. It can be overwhelming in the beginning when you are so new and you really haven't a clue of what you're going to do, what you want to do, when you want to do it, where, or why. And it's hard to listen to advice when you've been out for a "while" and are at your wit's end with rejections and opportunities falling apart. Take people's questions and advice with a grain of salt. Listen--because someone's observation of you may give you an insight of your hidden talents. Listen to what you've been telling yourself for years. I hate to drive or commute over an hour. I hate wearing a suit, etc. You know what is best for you. Other people's comments will offer insights. Just carry the colander!